Angelo Merendino/Getty ImagesHillary Clinton speaking in Cleveland. Hillary Clinton grew her lead over Republican rival Donald Trump in recent days, according to a tracking poll published Tuesday. An NBC/SurveyMonkey online national online poll of 10,604 adults showed Clinton with a 7 point lead over Trump, capturing 49% support. That’s notably higher than the former secretary of state’s lead over her Republican presidential rival last month, when she led him by just 3 points. The survey was conducted online June 6 to 12 and had a sample of error of 1.4 per cent. 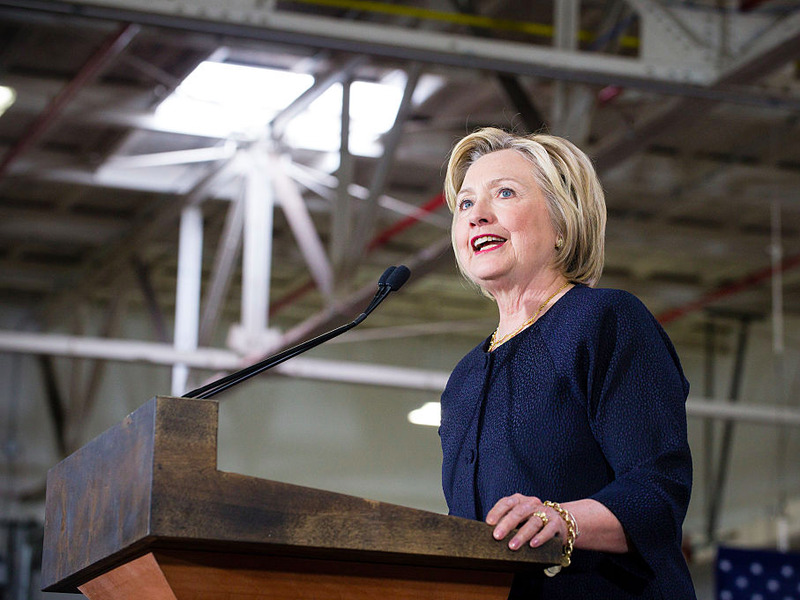 Clinton’s slight bump in the polls isn’t a huge shock to some observers. Candidates typically receive a boost in their poll numbers after securing their party’s nomination, as Trump experienced after his remaining Republican rivals dropped out following the Indiana primary. According to Tuesday’s poll, Clinton improved most among white voters and male voters, both groups that broke for Sen. Bernie Sanders during the Democratic presidential primary. Trump now leads Clinton by 9 points among white voters, down from 13 points last week, and 9 points about male voters, down from 14 points last week. Many experts note that there’s often volatility in early national polls after the primaries wrap up. Indeed, Tuesday’s poll was conducted before a horrific terrorist attack at an LGBT club in Orlando left at least 49 people dead. As 538 pointed out, the presumptive Republican presidential nominee tends to benefit in the polls following terrorist attacks. After suggesting that the US should bar all Muslims from entering the US in the wake of a terrorist attack in San Bernardino, California, Trump experienced a mini-surge, overtaking then-rivals like retired neurosurgeon Ben Carson. Still, a top Clinton campaign advisor told Business Insider that while national polls provide a snapshot of the race, Clinton’s team remains focused on polls of battleground state voters. Trump has asserted that his presidential victory will cut a new path through Rust Belt states like Wisconsin, Ohio, and Pennsylvania, which Republican presidential candidates haven’t won in several cycles. But many experts remain sceptical. Princeton polling expert Sam Wang told Business Insider in an email in late May that at this stage, the general election race looks almost identical to past contests.